Coke Zero - How does it taste like real Coke? You Are Here: Home -> Food & Drink -> Coke Zero – How does it taste like real Coke? What is in Coke Zero to make it taste so similar to real Coke? What is the difference between Coke Zero and Diet Coke? If you like real Coke but hate Diet Coke, you will probably like Coke Zero. There’s no getting away from it. Real Coca Cola is horrifically full of sugar. But it tastes great (guilty pleasure). So in the search for a low calorie alternative to real Coke we have had to put up with Diet Coke. But the problem is, for a lot of people Diet Coke is just disgusting. It tastes artificial, it makes your mouth and tongue curl and it just doesn’t taste anything like Coke. For many years there has been no other choice, but now Coca Cola has introduced Coke Zero. Coke Zero, like Diet Coke, claims to have practically no calories but crucially it has the taste of real Coke. And the simple fact is, it does really taste like Coke. The only aspect of real Coke that it doesn’t have is the knowledge that you just coated your mouth in a layer of sweet and sickly sugar. So what have they put in Coke Zero to make it taste like Coke, and not Diet Coke? Let’s look at the ingredients. What you will see is that essentially the ingredients are the same in Coke Zero and Diet Coke. 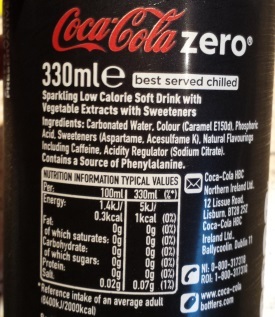 The sweeteners are Aspartame and Acesulfame K and it is still only 1 calorie per can. But we don’t know very much about the actual flavourings in Coke Zero from the ingredient list, apart from that they are ‘natural’. What Coca Cola have done is reworked the flavour profile of Coke Zero compared with Diet Coke. And they have done a wonderful job with it. Finally we have a ‘diet’ drink that actually compares to the real thing. Thank you Coke!